Let’s face it. 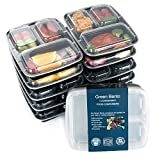 The meal prep lifestyle can be difficult without proper time management. 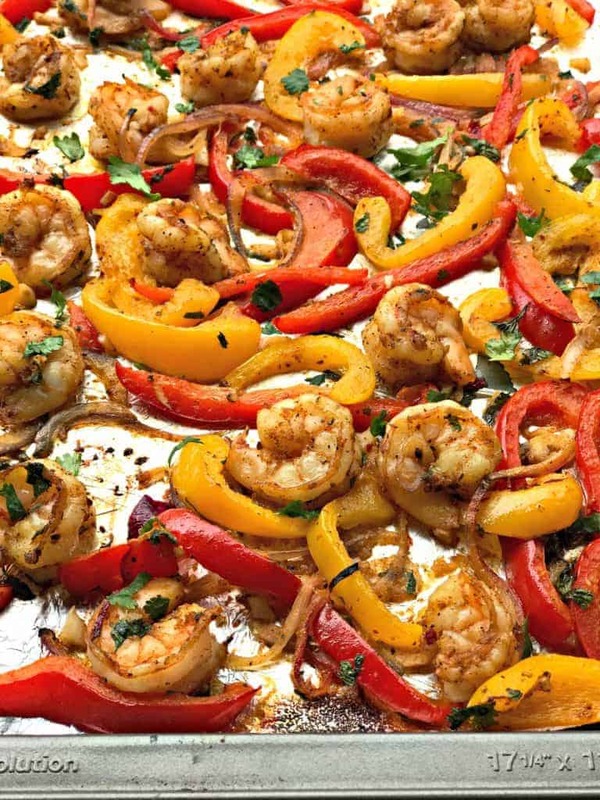 This one sheet-pan shrimp fajitas recipe helps solve that. Prepping is further complicated when events and commitments surface. My recent road block was the annual Kansas City Restaraunt Week. As a foodie, I usually try to commit to trying out at least two-three new restaurants. I did exactly that! 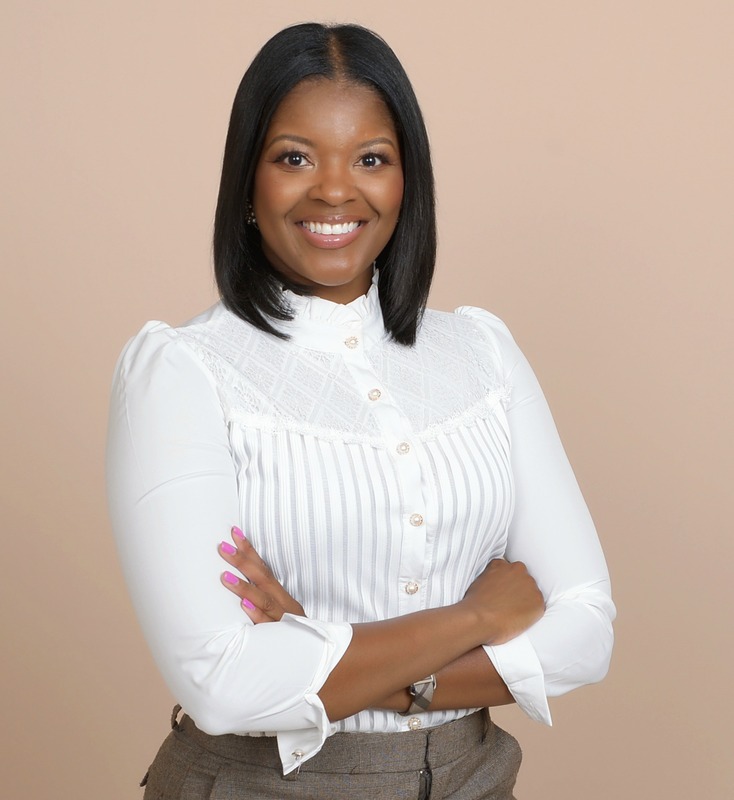 My time was very limited to plan out and actually cook my recipes. Sheet pan and one-skillet dinners are perfect for saving time. For this dish, I literally whipped everything together in a bowl, drizzled olive oil, sprinkled seasonings throughout, and spread everything on a sheet pan. Shrimp cooks incredibly fast. You really can’t go wrong here! I visited four restaurants for Restaurant Week. To provide a little background, Restaurant Week is an annual event in which multi-course meals are served for a largely discounted price. A portion of the proceeds raised by each restaurant is donated to various charitable organizations. Two of the restaurants I visited offered FOUR-course meals. The others offered three. Even with my two-a-days workout routine, I needed a meal with incredibly low carbs, yet delicious. These fajitas made an amazing recovery meal. I chose not to use tortillas because the fajitas are satisfying on their own, and HELLO, I could use a mini break from high carb meals. As noted below, I used Trader Joe’s Reduced-Guilt Guacamole to save myself additional time. Check out my homemade guac recipe here. Also a great option! The macros on typical guacamole are usually really good. Feel free to make your own if you wish. 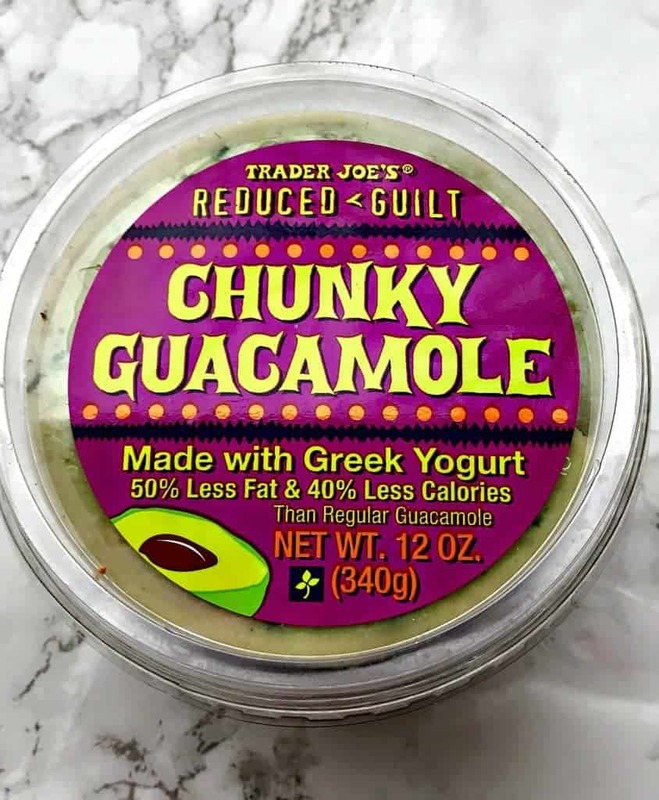 From time to time, I love to use the reduced-guilt guac from Trader Joe’s. I love the use of Greek yogurt. Very tasty! 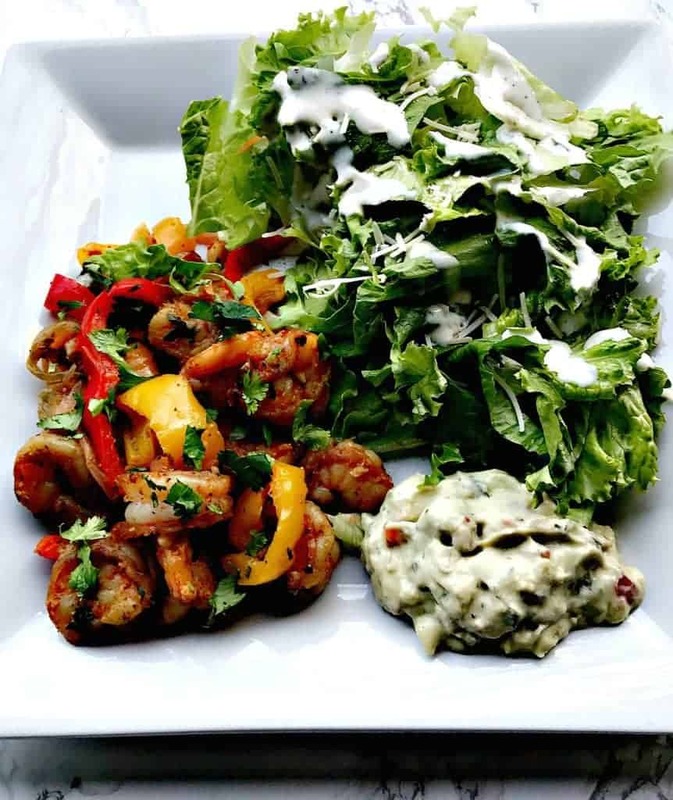 To keep the macros low, and to continue on the low carb trend of the dish, I paired the fajitas with a small side salad. I used the Parmesan Ranch dressing from Trader Joe’s. 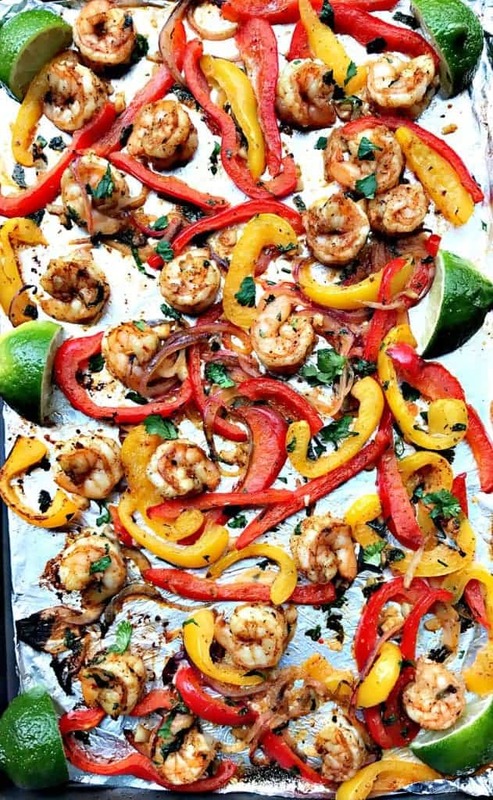 20-Minute Low-Carb One Sheet Pan Shrimp Fajitas is a quick and easy, keto, healthy, and low-calorie weeknight dinner recipe. 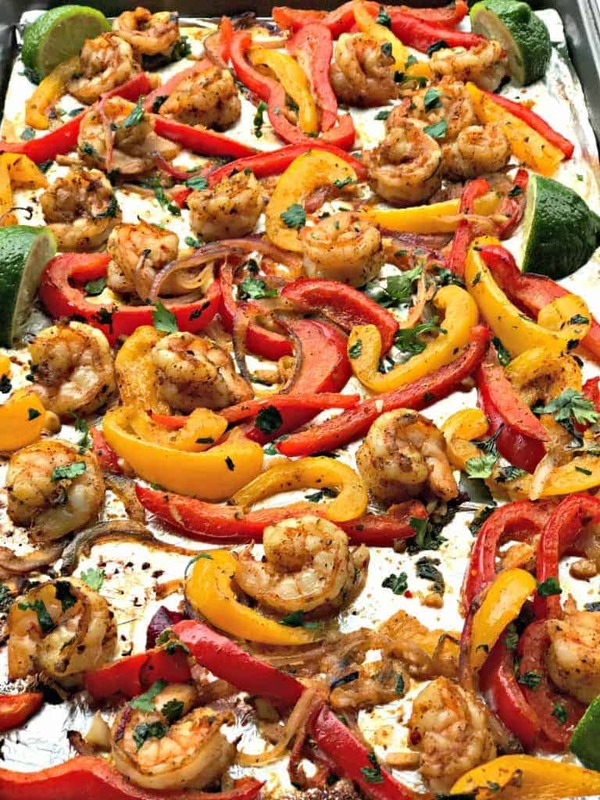 Place the shrimp, cilantro, and veggies in a medium-sized bowl. Line a baking pan with foil. Spray with cooking spray. Spread the contents evenly throughout the pan. Remove from the oven. Squeeze fresh lime juice throughout. This is on the crazy-fast end of the sheet pan meal spectrum—and it’s super-healthy and low calorie! What a great way to recover from Restaurant Week! Great flavors going on here. I love it! Yum! 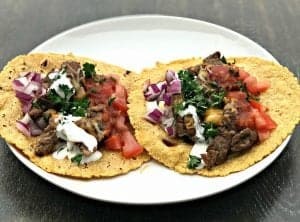 What a simple way to make delicious fajitas! What a great way to quickly prepare a meal! Lots of veggies too! Beautiful, quick and extra healthy recipe. Looking forward to trying. 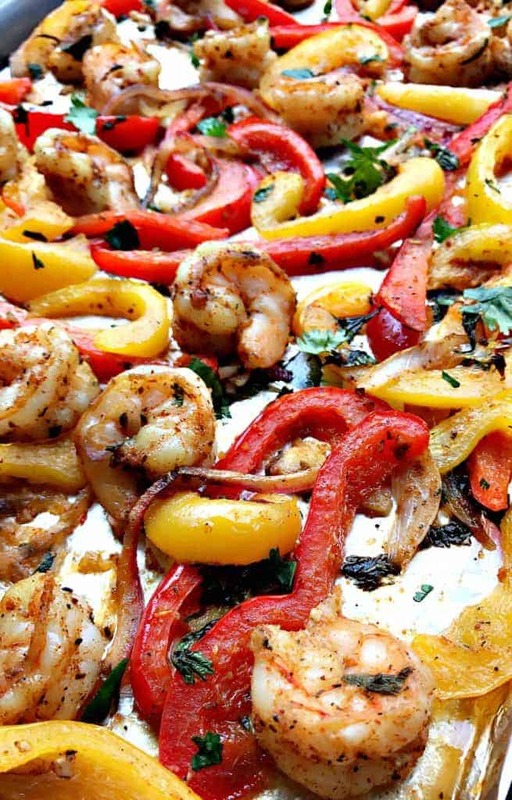 Shrimp is a favorite of mine and this recipe sounds absolutely delicious! 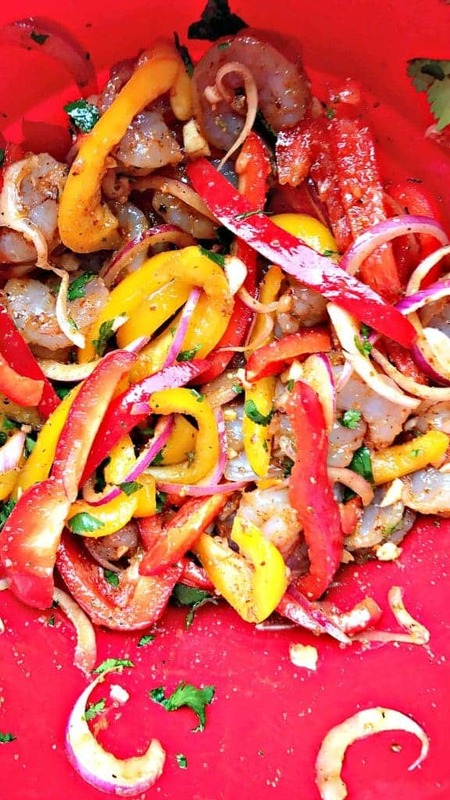 Fajitas are -hands down- one of my favorite dishes…and you say I can make it in 20 minutes? Sold! Can’t wait to give it a try! Yum! So good! And the colors are amazing. I love a good meal I can make in 20 minutes! This sounds and looks gorgeous with all those flavors! 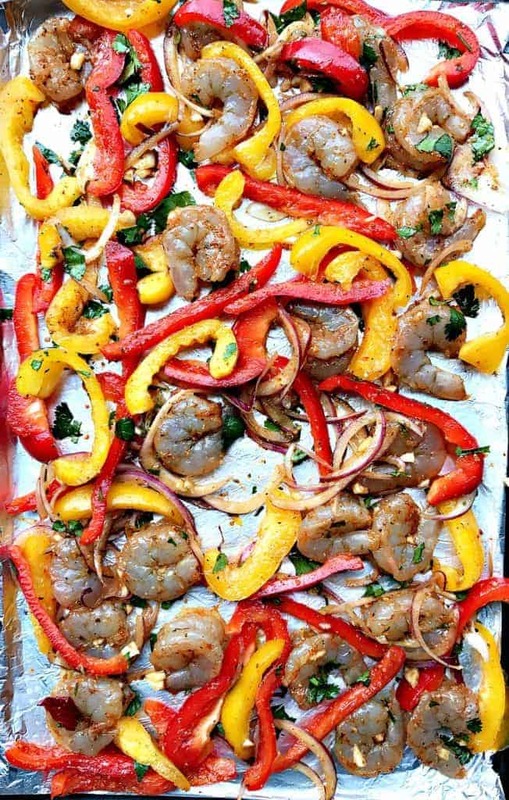 I love sheet pan meals like this! It’s so pretty and I bet so delicious with those shrimp. Such a wonderful one pan meal! Definitely perfect for weeknights. I love how easy and delicious it looks. 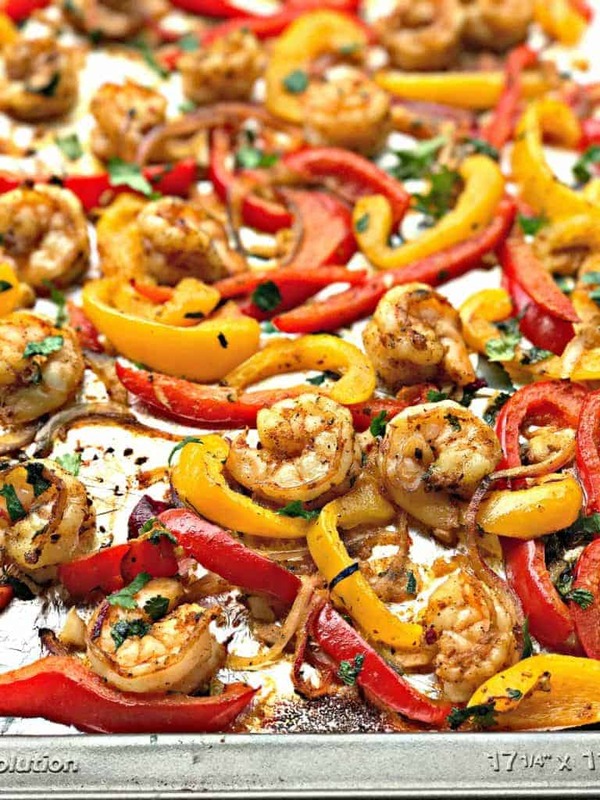 How smart to make these on a baking pan instead of an oily skillet! I am going to try your recipes and the Trader Joe’s guac. Yum! I love fajitas, and using only one pan sounds perfect, because I don’t love doing the dishes!! What a fast healthy meal. Would make a great lettuce wrap. I’m pretty sure this recipe is packed with all the lovely flavors! 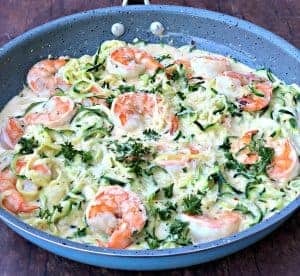 I would love to give it a try especially since it’s low-carb! Thanks for the recipe! Yummy this looks so great!! 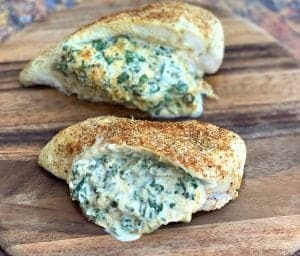 I love finding a meal that is so easy to make and doesn’t make a lot of dirty dishes!! Did I tell you I love shrimp? 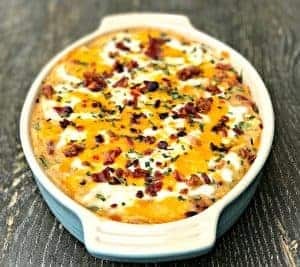 Yum, I am always on the search for low-carb recipes and this one looks like a winner to me! Love that it is quick too! Fajitas are awesome! I love the taste, color, and festive feeling when eating them ; ) I’ll have to give this recipe a try… thanks! I️ don’t even like shrimp but this sounds delicious. My husband would love it! I️ May try this. 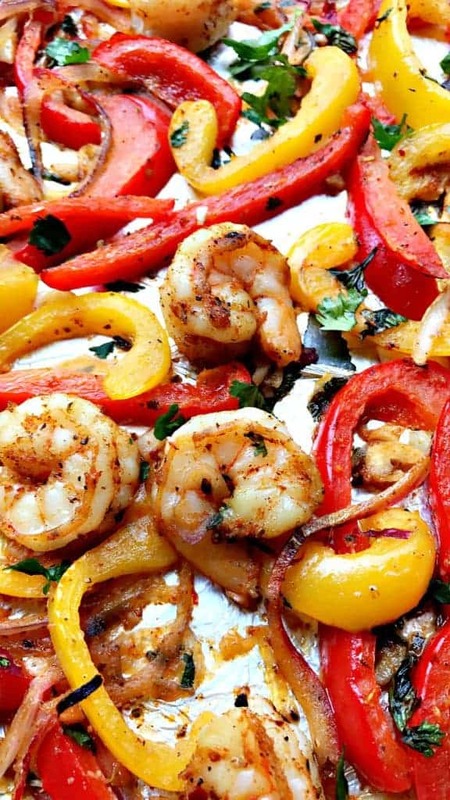 I literally just bought shrimp and plan on making this tomorrow! Looks amazing! Do you use the seasonings listed or just the taco seasoning or both? Sounds great! 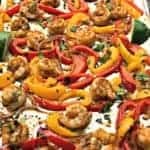 Do you cook shrimp from frozen or thawed please?